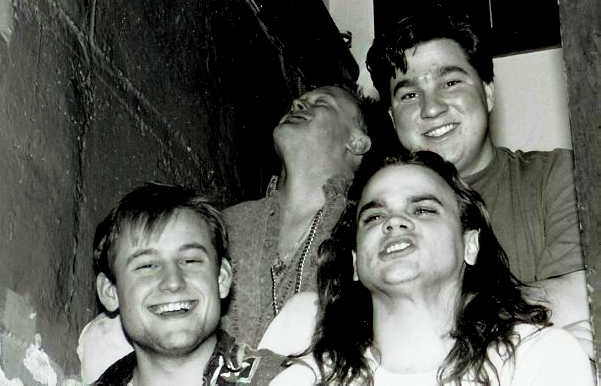 So, in 1988 when Mike and Paul first met at UWM they hatched the plan of starting a band. Jim was added, then Ron and the band was officially off the ground with our first gig in April of 1988 at the now destroyed, Thoma's Bar and Grill. Both Mike and Paul have moved on from the band, but when asked for a company function if they could field a band, they reassembled the original line up of R. Mutt for one show. Yeah, the show is at a mall. We play well with the stroller set. So, if you have had a hankering for songs off the first three records or just to see us all back together again come one out to Bayshore this Friday at 5:30 for two sets of Old Mutt. Then, don't forget to come on down to the beach on Saturday (9-14) at 8:00pm for a sweet set with the current line up as we close out a full day of music as part of Jigglesfest at Bradford Beach. Your pooch will then discover that returning to you is uplifting news and being put on the lead does not mean the finish of the walk and end of play!